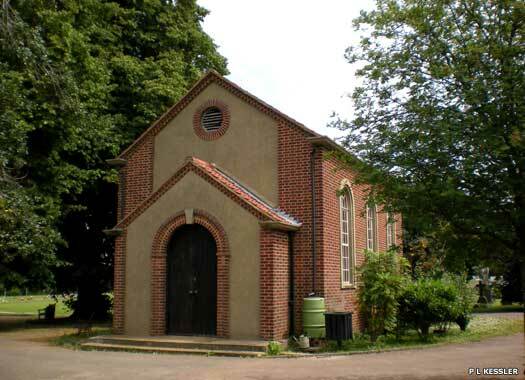 Epping Cemetery Chapel stands on the western side of Bury Lane, at the western edge of Epping. The chapel is non-denominational, making it available for Anglican, Catholic or Nonconformist burials. The cemetery has two sections, the original burial ground (to the right of the photo), and a lawned extension (behind and to the left). The original burial ground and chapel date to 1911. The former has a consecrated and unconsecrated section, but much of it is now full. The Catholic Church of the Immaculate Conception stands on the western side of Church Hill, opposite Church Field. The Catholic parish of Epping dates to 1932. 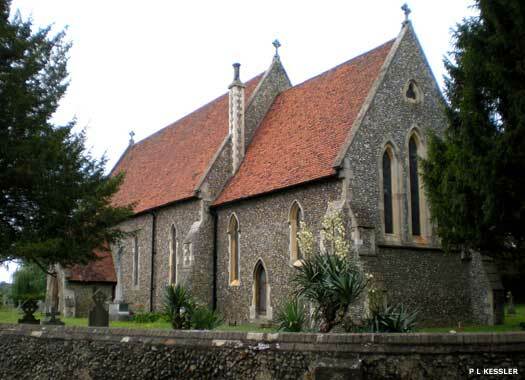 Prior to that, Catholics in Epping had been served by visiting priests. 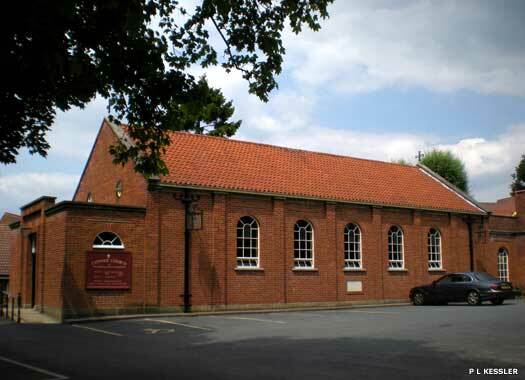 The first church was built from an ex-army wooden hut in 1932 and the first Mass was celebrated on Christmas Day. The foundation stone of the present building was laid on 25 June 1954 and the church was formally opened on 7 December 1954. Epping United Reformed Church is on the southern side of Lindsey Street, opposite Lynceley Grange. A Congregational church was founded here in 1692-1693. The church was rebuilt in 1774, and enlarged and given a Gothic front in 1887. The present building is entirely modern. There was a graveyard in front of the building, but this was closed in 1889. 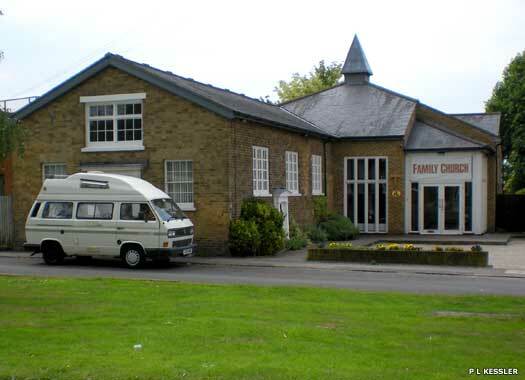 The small Fairfield Road Chapel stood not far away, but this was closed and entirely demolished around 2010. 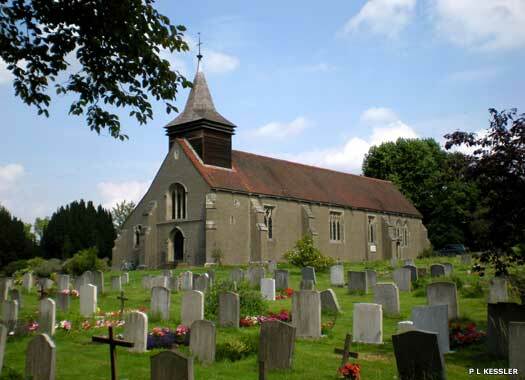 The Parish Church of St Alban Coopersale occupies a fairly long plot on the western side of Houblons Hill, where it meets Coopersale Common, on the eastern tip of Epping Forest and the town of Epping. 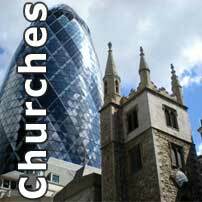 The church was built at the expense of Miss Archer-Houblon in 1852. It was consecrated in the same year and a particular district was assigned to it. The advowson was vested in Miss Archer-Houblon and it remained in her family until 1914. The flint building consists of chancel, nave, south porch, and north vestry with bell cote at the west end of the nave. The vicarage was also built at Miss Archer-Houblon's expense. It stands to the north of the church and is a gabled house of variegated brickwork, although it is now privately owned. Opposite the church is the parish room, a single-story building dating from about 1865, of brown brick with dressings of red and black which served originally as a school. 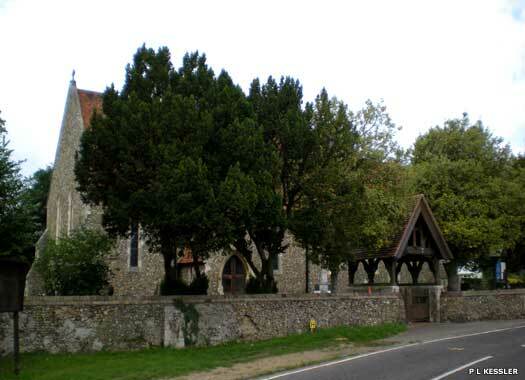 The Parish Church of St Thomas Upshire is encircled by trees on the southern side of Horshoe Hill, close to Woodreedon Farm Lane, Upshire, on the eastern edges of Waltham Abbey. From about 1870 services were held in the village school at Copped Hall Green, Upshire. St Thomas opened as a mission church in 1902. It was served from Waltham Holy Cross until 1956 when it was joined to High Beech parish. The roughcast brick building was designed by Freeman and Ogilvy.